No green thumb required. Seriously. Yeah, right. That’s what they told me about the air plant. And that’s what my aunt told me when she gave me that purple orchid for my birthday last year. You’ve heard it before, haven’t you? Haven’t we all. We’re told that it’s going to be easy and care-free to grow, yet somewhere along the line, the plant either dries up because we simply forgot to water it, or it catches some kind of flesh-eating disease and turns into what looks like a haunted house prop. Only to be cried over and thrown out over the back fence with anger and disgust. WATER – we have plenty of that, right? The main source that these plants are deriving their energy and life from is the water. Do give them Spring Water (they love it because of all the natural minerals). Do not give them tap water or purified drinking water (such as Aquafina or Dasani) or they will quickly turn into mutated carnivorous plants and eat you. (we’re just kidding, obviously.) However, your plants will thrive on what is best for them: Pure Spring Water. AIR – here’s where the easy part comes in. Neglect it. Forget that it’s even there. Let the plant drink up some of the water, and don’t replenish its supply right away. Why? Because when the water goes down, it exposes to roots to some air. Air is essential for plants growing in water. (Plus it keeps that slimy algae away.) If you’re good at neglecting plants, this step will be a breeze for you. OK – you want to take this further-? Here are some of the simple steps to start your plant rooting. First let me tell you some of the varieties of plants that work the best. I like to use ivy, English is my favorite but any variety will work, also Spider plants (the babies), Philodendron, Wandering Jew, and most herbs like rosemary, basil, mint, and oregano. Experiment with other things. You’ll be surprised how easy it is and how many plants root. Our plant rooters look great with a touch of fresh flowers added to the plant cuttings that are growing in there. When you take your plant cutting, cut them six or more inches long. Cut just below the leaf joint. Pull off any leaves on the lower portion, that part of the stem that will be in the water. You do not want any leaves in the water. Fill the rooter vase with water. Spring water is best. If you have good well water go ahead and use it. Do not use softened water, filtered water, or distilled water. Remember the plants are living on the trace minerals and nutrients found in the good water. Your plant rooter can be hung almost anywhere. Ivy plants like indirect sunlight. They look great in a window. Don’t be afraid of too much or too little sunlight. The plants, when in water, are not that particular about lighting. Most plants will show signs of rooting after 3 weeks, some even faster. Watch them grow. You do not need to do too much at this early stage. After about 6 to 8 months it may be time to change the water, at this point you can trim off some of the roots so the vase stays nice and clear. Once your plant has a well-developed root system, you can plant them in your favorite pot or leave them right in the plant rooter. We have had the same cuttings in some rooters for over 6 years. If you have any plant related questions please e-mail me and I will do my best to answer them. Enjoy your rooter. RODALE NEWS, EMMAUS, PA—Houseplants make you happy, and they clean your indoor air. But they also require upkeep and can feel daunting for the brown-thumbed among us. At least, until now. Introducing the ultimate, impossible-to-kill houseplant that grows in water and never has to be fed. Growing houseplants in water is similar to hydroponic farming, in which farmers grow crops in a mixture of liquid nutrients and water rather than in soil. “To grow plants, you need water, you need nutrients, you need oxygen, and you need something to keep it from falling over,” says David Emmons, owner of Vermont Nature Creations, a company that designs root vases for waterborne plants and herbs. “With most plants, the soil keeps it from tipping over and provides the nutrients.” But small houseplants and herbs can get adequate nutrient intake from water, which contains trace amounts of minerals and other nutrients that support plant growth. In other words, no soil required. This method for growing plants is great for novice indoor gardeners, he says, because it’s low-maintenance and keeps the plant largely free of disease and pest problems. “You eliminate most plant diseases because the majority are from soilborne mold and soilborne bugs,” he says. Without soil, you bypass those problems. Step 1—Pick your plant. Herbs are particularly well suited to indoor hydroponics, says Emmons. “Some herbs grow so fast in water, you see a new leaf almost every day.” Mints and oreganos grow fastest, followed by basil and rosemary. Lavender and sage are also favorites at his shop. As for houseplants, Emmons recommends any type of ivy (English ivy is his favorite), philodendron, wandering Jew, purple passion, and coleus. Even many flowering plants such begonias or impatiens will thrive in water. “It’s so wonderful to look up and see impatiens still flowering in your window in January!” says Emmons. 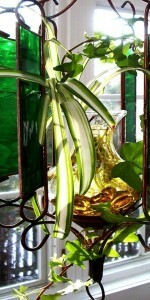 Read on for other tips on growing houseplants in water. Step 2—Root it. Once you’ve decided what to grow, clip a segment off the existing plant and place it in a glass jar, as you would if you were planning to root the cutting and plant it in soil. Always make sure you cut just below a leaf, says Emmons. That’s the “leaf node” and it’s where most of the rooting hormone within the plant is already active. If you don’t have any houseplants or an herb garden, you can always ask friends for cuttings from their plants. Step 3—Water it. The type of water you use is key, says Emmons. “City water is filtered, then it’s chlorinated,” he says. “It’s okay to drink, but it’s void of any nutrients.” Instead, use bottled spring water or well water, if you happen to have a private well, as water from the ground has the highest levels of minerals in it. As for containers, use any glass jar you have lying around, as long as it’s see-through. Emmons has done unscientific experiments at home and has found that amber glass helps plants grow the fastest, but any clear container will do, so the roots get some light. Oh yes, Step 4—Reassess in a year. At around the one-year mark, Emmons says, your water may start to look murky and will need to be changed. Also, the roots will have grown a good deal, so they need to be trimmed back so they don’t choke the plant. If you’re growing herbs, you may need to replace your cutting altogether after a year, depending on which herb you chose. The woodier or stronger the stem, the more time it will last in water, says Emmons. For instance, rosemary might live up to six years in water, but basil may only last a year.